1.In 4-quart saucepan, combine potatoes, 1 teaspoon salt, and enough water to cover; heat to boiling on high. Reduce heat to medium-low; cover and simmer 10 minutes or until potatoes are just fork-tender. 2.Meanwhile, in large bowl, whisk buttermilk with mayonnaise, dill, vinegar, Dijon, green onions, 1/4 teaspoon salt, and 1/4 teaspoon coarsely ground black pepper. 3.Drain potatoes well. Toss hot potatoes with buttermilk mixture until coated. (Mixture will look very loose before chilling.) Cover and refrigerate potato salad at least 2 hours or overnight to blend flavors and cool slightly, stirring gently after 1 hour. 1.If using bamboo skewers, soak skewers in hot water at least 30 minutes. Prepare outdoor grill for direct grilling on medium. 2.In large bowl, combine sugar, paprika, chili powder, red pepper, 3/4 teaspoon salt, and 1/2 teaspoon freshly ground black pepper. Rub mixture between fingers to break up any lumps of sugar. Add salmon and zucchini and toss to evenly coat with spice mixture. 3.Thread zucchini slices, 2 at a time and alternating with salmon, onto skewers. Place on hot grill grate and cook 9 to 11 minutes or until salmon turns opaque throughout, turning occasionally. 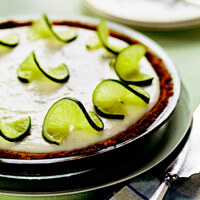 1.Preheat oven to 375 degrees F. In 9-inch glass pie plate, mix crumbs with spread, sugar, and salt to moisten. With hand, press onto bottom and up sides of pie plate. Bake 10 to 12 minutes, until golden. Cool until ready to fill. 2.Meanwhile, to 1-quart saucepan, add water; sprinkle with gelatin. Let stand 2 minutes to soften. Cook on low to dissolve, stirring. Remove from heat. 3.From limes, grate 2 teaspoons peel and squeeze 1/2 cup juice; if using Key limes, do not use grated peel — it will make filling taste bitter. In bowl, whisk lime peel and juice, milk, and yogurt. Whisk in gelatin mixture. 4.Spoon filling into crust. Cover; refrigerate at least 2 hours to set.